I arrived at Heathrow nervous but excited! The day has finally arrived and my partner in crime DJ Dave and I are on route to Kilimanjaro to climb the world’s highest free standing mountain. I can’t wait to start the journey and like all good adventures it starts with 1 or 5 alcoholic beverages. Dave and I have a long but sociable flight talking about the trek and our group who we have yet to meet. Going through to get our visas at Kilimanjaro airport was actually really easy and only took 10 minutes, some of our colleagues had taken a little longer the night before so we were lucky. On our way out we were greeted by our wonderful guide and leader Rolfe Oostra who was full of smiles. He explained we were just waiting for a few more members of the group and then we would be on our way to the hotel. Dave and I were eager to meet our fellow climbers and also couldn’t wait to get to the hotel to be debriefed and meet everyone else. The journey to the hotel only took 40 minutes and it took us through some beautiful scenery, little markets, towns and villages. What struck me was how colourful everything was – from the clothes the local women wore right down to the market stall decoration. Fabulous! All of our suitcases were loaded onto the bus and albeit cliché all of our bags were loaded onto the roof rack. We arrived at Sal Saleniro hotel in Moshi at 12pm and headed straight for the bar as the rooms weren’t quite ready. The hotel was lovely and set in beautiful grounds. 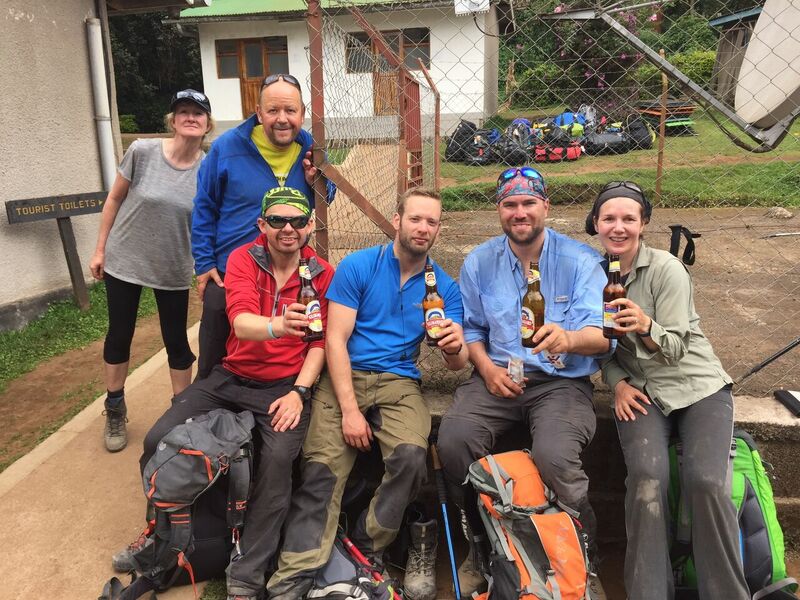 We met some of our group in the bar and celebrated meeting each other and embarking on this marvellous challenge together. At 12.30 we checked into our rooms which were like little villas, all very spacious and cool. Lunch was at 2pm and this is where we met everyone who was on the trek. A lunch table was set up in the grounds and everyone ate, drank and was in good spirits. This was going to be a good group I could tell. Rolfe gave us all a briefing and explained how the trek was going to happen. He inspires confidence and I felt assured he knows what he’s doing. He is very laid back and has a great sense of humour. At 10pm we had all turned in to get a good night’s sleep. I was itching to start the trek and want to get going now. We had been told by Rolfe to be ready to leave at 9.30am with all of our bags sorted. This meant that your day pack had to be packed, along with the bag that was travelling up the mountain with you. Your ‘party bag’ stayed at the hotel ready for your return. We set off around 10am to Kilimanjaro national park to sign in and get ready for a short stroll (as it was our first day). We set off from Shira Plateau to walk the 2 and a half hours up to camp. This was through moorland and heather shrub lands. It reminded me of the Yorkshire moors back home apart from the fact that it’s not 2,900 meters above sea level. The pace was slow as Rolfe wanted to break us in gently and acclimatise us. It’s not until you walk up and down a couple of valleys that you realise you’re at altitude (I was panting a little bit). The porters passed us with all of our camping kit (all 65 of them) and were walking at such a pace. They must be as fit as mountain goats. The sky started to clear half way through the walk and we saw the most beautiful views, mountains, landscapes and clouds hovering just below the mountain tops. You had to stop and look. It was a ‘WOW’ moment and you are suddenly reminded of where you are and why you’ve come. It’s not just about the summit, it’s about the journey you travel every day. We arrived in camp at 5 pm to a fantastic welcome by all of our crew. They were singing ‘welcome’ to us and dancing for us. I felt quite emotional walking up to our camping area. The singing went on for about 5 minutes and in that time the lead singer of the crew kept changing the lyrics to make us laugh. We were allocated our tents and personal porters (what a lovely touch) and after we’d sorted ourselves out, went to the mess tent (the place we were going to eat, drink, snack and play cards for the next 7 days) for coffee and popcorn. A two course dinner ensued before swapping stories and having a laugh with the rest of our group. Our beds were calling at about 10pm but before we went back to the tents, we were told to switch off our head torches and look at the stars. Oh my goodness. The sky was clear and lit up by thousands of stars. It was amazing. I feel privileged to be sleeping out amongst them. Trying to sleep was fun, it may feel warm during the day but it’s freezing at night. Well, sleep definitely evaded me but it might have been due to altitude. I also found that I needed the loo a lot which is not fun when it’s so cold outside! I was wide awake at 4am but I don’t think I was the only one as I heard several of our group chatting. Coffee came round at 7am and breakfast followed not long after. I have to say, the food has been marvellous! I cannot fault it at all. Breakfast was pancakes, porridge, sausage and toast. Just what you need for a day’s walking. We officially met our crew straight afterwards as we all introduced ourselves. We started walking at 8.30am but today was only going to be 4 hours as we once again continued to acclimatise. The pace was slow but we were assured that this was the right thing to do to ensure we didn’t suffer too much the effects of altitude. The views were beautiful today as we climbed to around 3,800 meters just above the clouds. Dave and I kept ourselves occupied by doing ‘pop quizzes’ of our top 10 all-time favourites. The subjects included film, songs, holidays, concerts and albums. The walk was fine and everyone kept up. The guides are good at ensuring everyone is ok. We arrived at Shira camp 2 at about 2.30pm – 3pm which meant we had the rest of the afternoon to chill out and rest. There was also time to explore though which is exactly what Dave and I did. 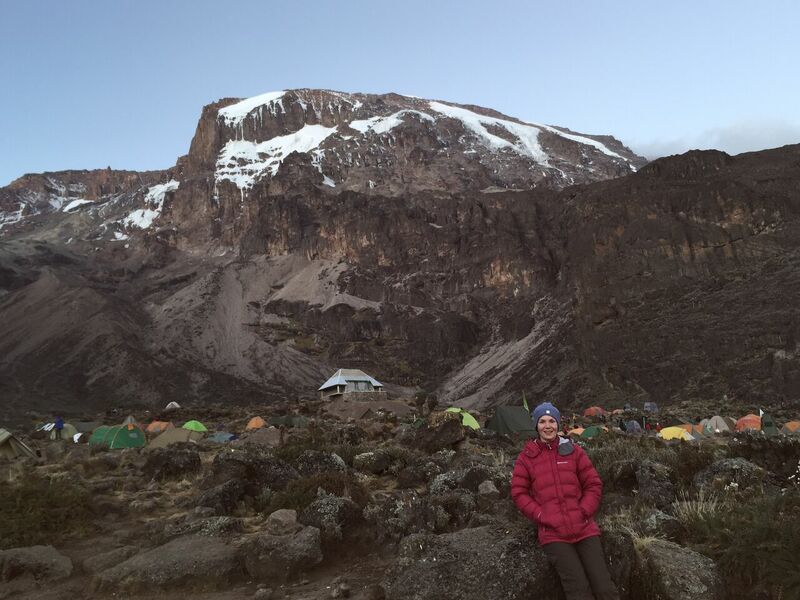 Once again the views were beautiful and the beast Kilimanjaro was in full view. It’s hard to imagine we will actually be climbing all the way to the top. I had a little moment at that point. We are in Africa! We are going to climb this mountain? On return to camp, a raucous game of cards ensued between the group. For the sake of this blog, the language will be top secret but let’s just say a few of our group clearly have Tourette’s and don’t like losing. Rolfe had explained to us that tomorrow will be a tough day. It’s an 8 hour walk up to around 4,600 meters. This will be the highest I’ve ever been. I’m nervous and need to make sure I sleep tonight. I realise as dinner is served (another fab meal of soup, fish, potatoes and veg) just how much I’m eating. Rolfe informs us you can burn approximately 1,500 calories a day through altitude alone. I don’t need an excuse to eat more. After dinner, we see our crew members stood outside the door. Once we all go outside the crew start to sing ‘Happy Birthday’ to one of our group Adrian. They have baked a cake for him (a difficult feat on a large gas stove in a tent I’m guessing), it’s decorated in icing with the 360 Expeditions logo on it! Rolfe has also bought champagne for this occasion also.We celebrate for a while eating cake and drinking champers as the crew sing and dance. I bet that Birthday celebration will take some beating. What a memory to take home. We were woken at 5.45am today to ensure a good start for our long walk. 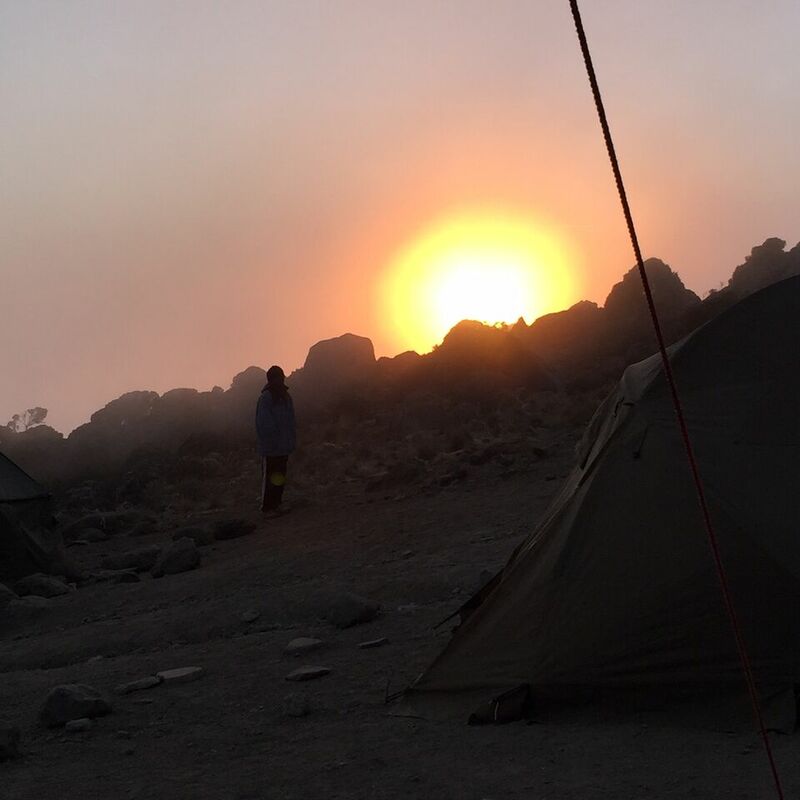 After having coffee and watching the sunrise over Kilimanjaro we also realised we had a stunning view of Mount Maru above the cloud line. The sun was out and you could see for miles. The clouds looked like snow and you felt you could almost walk on them. The pace was once again slow but understood by all the group that this is best. The group and I were chatting about nothing in particular, this coupled with a lovely trek and some stunning views made for a very happy morning. We stopped for lunch at the Lava tower which is spectacular. It’s almost a mountain in itself and is approximately 80 – 100 meters high. Some of the group were really shattered and suffering the effects of altitude sickness (headaches, nausea and insomnia from the night before) so after another spectacular lunch of soup, pork balls, egg rolls and potatoes there was a small group of 7 of us that decided the climb the lava tower. 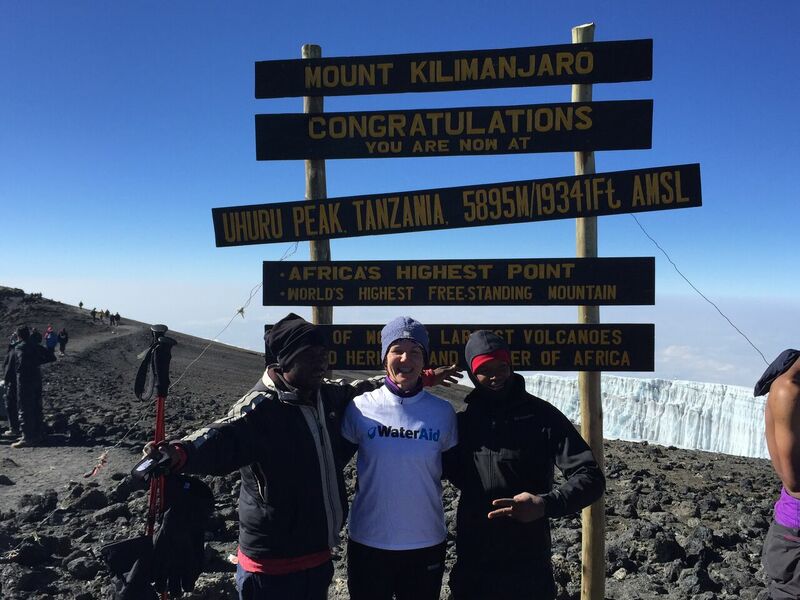 Rolfe guided us through the climb along with Jobe and Patrick (2 of our guides) it was both exhilarating and exhausting but the views from the top were breath-taking! It’s times like this when I also believe Rolfe isn’t scared of anything. He is the adventure guides equivalent of Superman! On our return to camp, we continued our trek to Baranko camp. Although it was only another 3 hours walk it seemed really long. We passed through some beautiful scenery though with streams and vegetation and some really weird trees. As we were descending to camp, Brent and I got to hear some of Rolfe stories and expeditions. This made the walk very interesting. Wow! I think Rolfe should write a book. He has literally saved people’s lives. I have total respect for this man and loved listening to him. He’s so laid back about everything too and takes everything in his stride. As we saw camp, it struck me how massive it is. There must be over 30 different groups here tonight. Once in camp I joined the group for coffee and nuts in the mess tent before attempting to call my husband Stuart. It’s the first time I’ve had signal. It was so lovely to hear his voice and he was clearly pleased to know I was safe. Dinner was quiet but I think the group are tired and as I’ve already said, some were suffering a little from the altitude. Most of the group were in bed by 7.30pm with just a handful playing cards until 8.30pm. 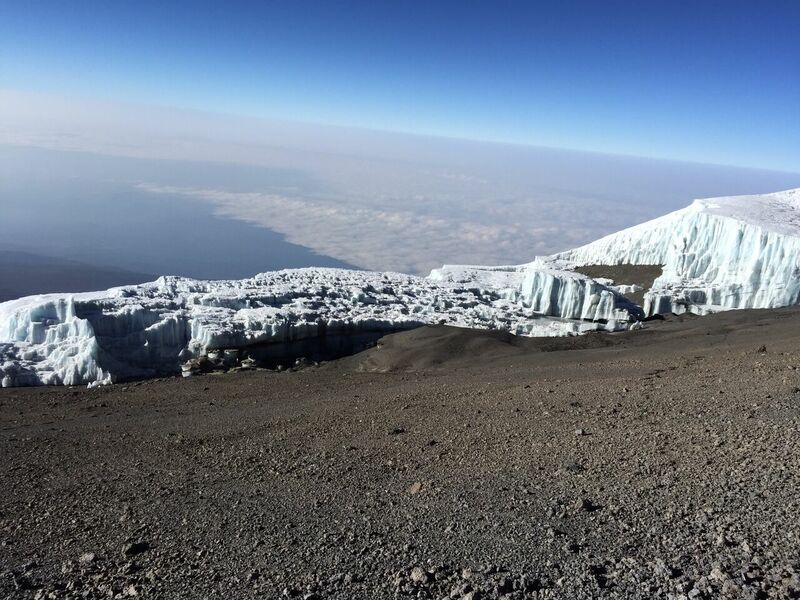 Tomorrow is a late start as we are going to let the other groups get ahead but we are climbing the Baranko wall which we’ve been told is quite difficult and a bit of a scramble. I’m really looking forward to it. Today started later than planned as we needed to let the other groups leave before us. The Baranko wall looked hellish. And as we started our ascent, I realised why we had waited. The wall was a very steep climb and once you started, it’s pretty much single file all the way to the top. When we eventually got to the top however, the scramble was worth it. It was almost like a mini summit. The view was beautiful with Kili on one side and a view of Moshi (the village we originally arrived in) on the other. We stopped for a break and took lots of group pictures before carrying on. I have felt ok today although I did take some paracetamol and Ibuprofen to ward off the headache I had felt coming on since the morning. There have been a couple of difficult hills and climbs today which have left me tired but otherwise I’m not feeling the effects of altitude. I did however, make the mistake of wearing my thermal pants this morning as I have been so cold at night and early morning. I was so hot! And there was nowhere to undress. I won’t make that mistake again. The terrain was all dust and rocks and if you’re not careful you can slip very easily. The paths were long and winding and the group were quiet today. We reached an altitude of 4,400 and I think some of the group were still acclimatising. Today’s camp is also busy but it’s nice to be with other groups sometimes and we have seen many familiar faces. It was also raining and covered in cloud when we arrived. The cloud covered the scenery which is a shame. The cloud cleared later on that afternoon and we had the most spectacular view of Kilimanjaro. It’s getting so close now and I’m both excited and nervous. Rolfe has been boosting our confidence and thinks we are a strong enough group to summit. We have been told that the walk to high camp tomorrow is only 3 hours and we should arrive at 11am. The idea then is to rest all day as we will set off to summit around 1 am. It will be 1,200 meters we will have to climb in 1 night. After dinner we played cards with Rolfe, Moussa, Dave, Ryan, Mike and Brent to name but a few of our group. Banter between us all was spirited and humorous. I think we’re all thinking about tonight and feeling the excitement. We set off today straight after breakfast at about 8am. The trek today is only short but it’s a steady ascent to 4,600 meters. The climb was slow and not too difficult. 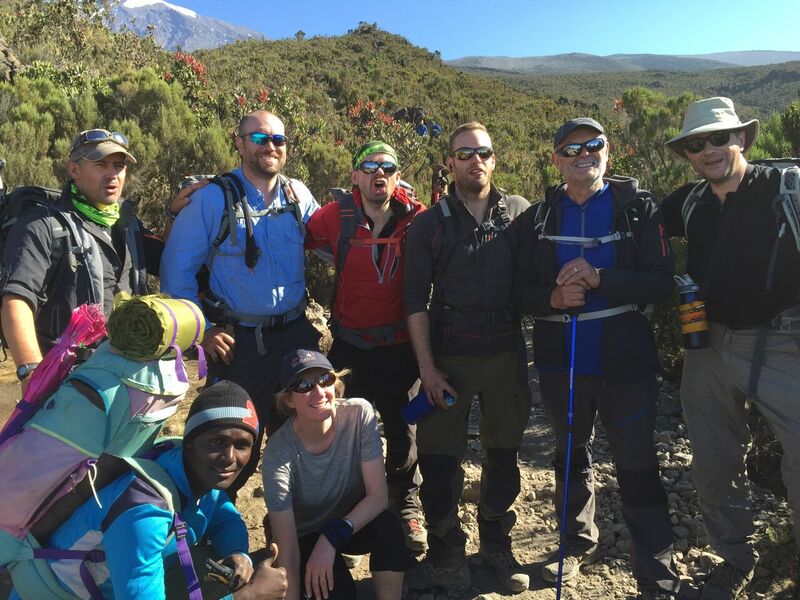 The terrain was dusty and rocky with the ever present summit of Kilimanjaro on our left. We have a few people who are struggling with altitude so we are all being very careful. It was very cold when we got to camp and I had 3 layers on. But the wind chill was something else and it was hailing. This camp is all rocks with few scenic views. It’s so dusty and dirty too. While having lunch Rolfe briefed us on summit night and what would happen. I’m a little scared but I have every confidence in Rolfe, he knows what he’s doing as does his crew. We will be woken at midnight and we need to be fully dressed and ready to go. We will start a 7 hour ascent to the summit at about 1am which will be tough going in -15c. The pace will be slow and hard. Once we are at the summit, we will take pics and spend about half an hour there before descending (3 hours) back to high camp. That’s a 15 hour day. Rolfe went through the symptoms of altitude sickness with us and said if we did throw up, feel dizzy or exhausted we shouldn’t be put off by this. This man is invincible! We have all day to rest in our tents, have dinner and hopefully sleep. We had a wakeup call scheduled for 12am but to be honest, I was awake way before that thinking about what the day was going to bring. It was so cold I can’t even describe it. My whole body was shivering and my hands actually hurt with the cold. I had my base layer, long sleeved top, my Wateraid t shirt, mountain fleece and coat. On the bottom was my thermal leggings and trousers with 2 pairs of socks, 2 hats, a pair of gloves and a scarf! I looked like the Michelin man. The guides set a steady pace and I plugged in my iPod to keep myself motivated. It got colder and colder the higher we went and my down coat went on about 3 hours into the climb. It was very hard walking in the dark as you can’t see anything around you and very much rely on the person in front of you. Even though Rolfe had told us to keep hydrated I was frightened to drink too much because it was too cold to stop and pee anywhere. The wind actually hurt my face and my camelback water froze. I had water in my jacket to stop it from freezing. We didn’t really take any breaks while climbing as it was too cold. We have already lost 2 of our group who couldn’t continue with the climb due to coldness and altitude. As we approached 5,000 meters I started to feel funny. I felt dizzy and anxious and realised I was taking short sharp breaths which I think had contributed to a bit of a headache. I took pain killers at the next stop and started to try and take deep breaths every few minutes to help with the dizziness. Ultimately it’s a bit of mind over matter and I just had to ‘ride this out’ and make sure it didn’t get the better of me. The guides and porters were excellent throughout the climb and checked in with us all the time. They also sang songs to help boost morale while Rolfe did a military style chant which made me laugh but also helped when you were feeling shattered. At 5,200 meters we were all finding it tough. There were some people feeling drunk, sick and suffering from cramps. The porters were taking people’s rucksacks to help lighten the load and conversation of any kind had stopped. By 5,500 meters we had our first glimpse of the glaciers. Oh my goodness they were just beautiful, amazing in fact. The sun then started to rise over the volcano and it just took my breath away. I’ve never seen a sunrise like that before especially when you are almost at the highest point in Africa. It’s just what we needed to motivate us to carry on. As we continued to walk at the same pace I realised just how long it was going to take us to reach the summit. The climb was getting steeper and I was becoming exhausted. My heart was racing and I had to remind myself that this is how fast my heart goes when I’m at the gym working out. As we reached about 5,700 meters I felt the summit would never come. The porters and guides were still trying to spur us on but I could have gone to sleep on my feet at that moment. 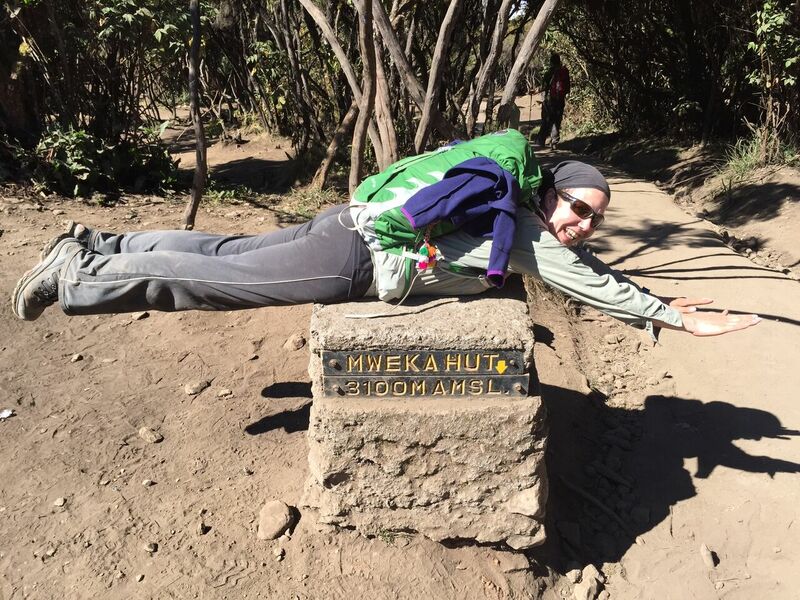 When we got to the top (who knew Kili had 2 summits) there was a sign that said Stellar Point 5,756 meters. Although we stopped and took our packs off, you realise you still have 139 meters to go. This is not a good feeling and I honestly felt that mentally and physically I was spent. It took another 45 minutes just to get to the summit but the views of the glaciers from the top were stunning. When the rest of the group got there we had a group photo and just celebrated being at the top of Africa. I was quite emotional and couldn’t really quite believe we had done it. We have climbed to the top! Our descent was much more fun and you’ll be surprised at how much more energy you have when you start to come down. You can almost ski down the mountain as the screed is loose. You have to be a bit careful and I used my walking poles as ski poles. It only took 2 hours or get down. My feet and knees hurt but it was worth it. When I got back to high camp I was tired and filthy and really thirsty. Skiing down the mountain kicks up a lot of dust. I was welcomed back to camp however with a bowl of warm water to wash in and a cold glass of juice to drink by kitchen staff. Right, that was the best thing ever. When all of our group returned we had lunch at Barafu camp before packing up our things and heading down to Millennium camp for our last night camping. Spirits were high although I don’t think it has really sunk in for anyone that we had actually climbed Kilimanjaro. We chatted about our achievement while playing cards and it was a really lovely atmosphere. I have made some good friends. People I will definitely stay in touch with. We had a celebratory meal tonight of beef and spicy bean sauce with rice followed by a sticky toffee pudding. Yummy. I went to bed early as I wanted to write my journal and pack everything before the last walk to the gate of Kilimanjaro Park tomorrow. It has been an awesome journey, full of mixed emotions today and I’ve never done anything so tiring in all my life. It’s been such an amazing adventure, scary, challenging and life changing. Rolfe and the crew he has around him are amazing and I would definitely use 360 expeditions again. Thanks to everyone at 360.